A relaxed interview allows us to discuss all your requirements. And we will work out together how you want everything done. My aim is always to make all ceremonies easy and relaxed so you can actually enjoy the occasion. Both in the preparations and the ceremony we want to push any nervous feelings right into the background. 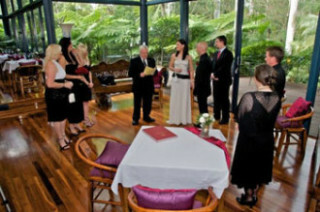 As celebrant I deliver well-spoken and well-voiced ceremonies. My ceremonies can be presented as formally or informally as you like – but ALWAYS with dignity (and perhaps some quiet and appropriate humour). Your ceremony will always be given ample time – you have my guarantee that no other ceremony will be booked close to yours. If you require it, I can provide a small PA system. Also a second system for music – all you need to do is bring your iPod. Special requests can be easily arranged. Don’t hesitate to ask! Complete familiarity with your special ceremony. There won’t be any mistakes or embarrassing moments on my part, and I’ll quietly help you to avoid them too. My personal intention is that I will meet your expectations 110 percent! You are benefitting from the experience of more than 19 years as a celebrant – and over 1600 weddings performed! Talk to me today about my quality, personalised celebrant service . . .
. . . and how I can make your special event more memorable! Wedding-day ( and time and place) . . . how to choose . . .
To read our Privacy and Security Policy, please click here.